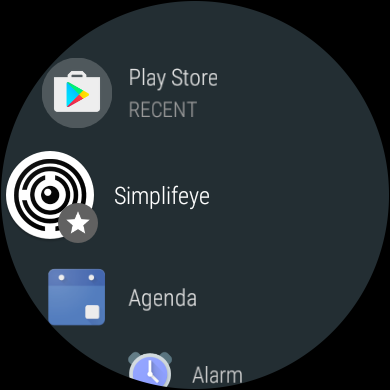 This guide will instruct Android users with Android Wear watches on how to setup their devices for Simplifeye. Android Wear watches have increased independence from the phone, so you'll also have to make sure to install the application on your Watch separately as written below. Turn on your phone, and make sure Bluetooth is activated. Download the Android Wear application from the Google Play Store onto your phone. Turn on your Watch and “Tap to begin” as instructed. You’ll then be asked to select a language. Open the “Android Wear” application on your phone and tap “Set It Up”, and turn on Bluetooth if it’s not on already. On your phone, you should now see “Connect your watch” and a list of device names like the one displayed on the Watch. Make sure to select the Watch name and digits that match your Watch. The devices will now connect. If this attempt fails just tap the option to “RETRY” at the bottom of the display. A “Bluetooth pairing request” prompt will then appear. Confirm that the 6-digit passkey on both devices are the same and tap “OK” to complete the connection. The devices will begin checking for updates and will install them if necessary. This may take a few minutes. Android allows you to have multiple Google accounts (similar to Apple IDs) on your phone, so users will have the ability to select the ones they’d like to use on their Watch. Choose the desired Google accounts you want to have on your Watch and tap “Next”; you must copy over at least one account to be able to install applications on the Watch. Tap “Next” on the page titled “Confirm to continue”. For security purposes, you will have to enter your screen lock PIN in order to confirm ownership. Enter your PIN and tap “Next” again. Tap “Copy” to continue. Enter the selected Google account's password when prompted to finalize. Tap “Done” and you’re all set! Tap “Install” to begin the installation. You’ll know the installation is complete when you see the option to “Open” the app. 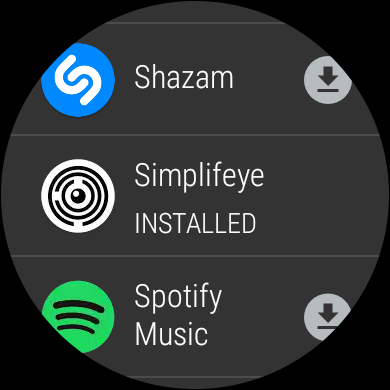 To use Simplifeye on your Watch, you'll have to perform a separate download of the app to the device. Once the Watch has awoken and you see the current clock face, press the power button again to see the list of installed apps. You should now see a green magnifying glass at the top of the display. Scroll down to the section marked “Apps on your phone”. Because Simplifeye is already installed on your phone, you should be able to find the Simplifeye icon in this section. Tap the download icon to immediately download it to your Watch. 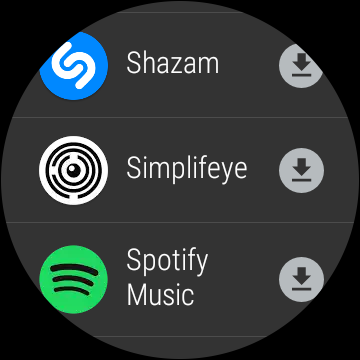 Once you’ve signed into Simplifeye on your Android phone, you’ll be automatically signed into your paired Watch! If this isn't the case, try logging out of and back into the Simplifeye phone app.